All apologies. 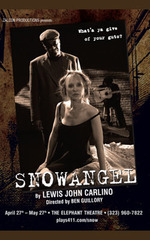 I’ve been at the theatre every night (except last night) since last Tuesday in tech for my next production, Snowangel, which opens officially this Thursday. I’m a bit exhausted from that, lack of sufficient sleep and no exercise. This Sunday should be a day of errands however with City of Angels Fun Ride happening I think it may end up being a day of rest and recovery. More info on the tours and how to sign up can be found here. As always, drop me a note if you sign-up so I know to be on the lookout for ya'! Back to the regularly scheduled programming next week, when this theatre madness is over. Here is ample (yet not too far in advance) warning that I am scheduled to lead a USC Walking Tour on Saturday February 11th at 10am. This tour is my 2nd favorite of all the ones I give with Historic Core beating it out ever so slightly. For the next few months my tour schedule will be reduced as Saturday's will be spent serving as a mentor for new docents going through Docent Training class. I absolutely love this part of the year as I get to meet new people excited about learning about Downtown history and architecture. In the process I also learn new things about the tours too, other perspectives on something you see so often can be beneficial in the long run. For more info or to sign up click here or call (213) 623-CITY....and be sure to let me know you're comin'! On Saturday morning 9 docents gave tours to 250+ people as part of the new member "thank you tour" for joining the Los Angeles Conservancy. I was one of the 9. Jim was one of the 250+ but unfortunately he didn't get there early enough to get on board with the most fabulous tour guide of all time. That's OK though, all he did was click away at the gorgeous surroundings. Me thinks he could have a career as a fledgling photographer of all things Los Angeles. I smell coffee table book. I'm just sayin'. Afterwards we walked over to Philippe's for some good old French Dip. Or in my case Turkey Dip. As I was sitting there enjoying the surroundings I remembered back to a few months ago when I had last given a Union Station Tour, afterwards I walked down to Philippe's for a bite and ended up running into an old friend. This time similar circumstances occurred whereby someone I indirectly work with was there with his son. Crazy. Philippe's, bringing Los Angeles together. It's that time again...time to promote the 2 walking tours that I'm scheduled for this month. First up, on Saturday November 12th at 10am I will be giving a USC Tour. This is quickly becoming one of my favorites as it is a beautiful campus and the connection the school has to the growth of the city is very apparent. It helps if you take this tour after you've done the Historic Core tour as there is considerable overlap in architects although that is certainly not a requirement. Next, on Saturday November 26th (Thanksgiving weekend) AND December 10th at 10am I will be giving the Historic Core Tour. This is by far my favorite tour to give and with each outing I proclaim said tour to be my "best yet." Brilliance is difficult but somehow I manage. Joke. That was a joke people. I'm not THAT self centered....sheesh. If you're interested in signing up follow this link to the Los Angeles Conservancy's website. See you on the streets!